This hunt really started in March of 2011 when I agreed to a sponsorship contract with BPI, Inc. -- the makers of CVA muzzleloaders and Bergara barrels and rifles. At that time I made a decision to capture a full Super Slam of North America (29 species) with a muzzleloader in High Definition video for our television series, Steve’s Outdoors Adventures. I knew this would be a heavy task but I started looking at the hunts I needed to complete and talking to our outfitters to make some plans. 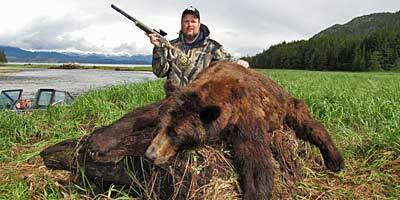 In my opinion the best area to hunt for a grizzly that has record book potential is in coastal British Columbia. And when I reviewed the Long Hunter Record book that records muzzleloader trophies, I discovered that no one had ever entered a grizzly with a Boone and Crockett skull measurement (24 inches B&C All-Time Book Requirement) and the area where I wanted to hunt had produced bears up to and exceeding 26 B&C with a high percentage of bears taken measuring over 24 B&C. So truthfully I went into this hunt with the knowledge that I could indeed take the largest grizzly ever recorded with a muzzleloader. We decided to start the hunt on June 1 when the bears are rutting hard and there are sows chased by boars on the beaches. We boarded the 54-foot Yukon Bear towing a jet boat and two skiffs and headed five hours up a protected inside passage where my guide and outfitter had traditionally seen a lot of bears and was sure we would see a big boar worthy of hunting. I don't think he understood exactly how quickly we would see this bear! Once we reached the hunting area we pulled into a bay where we wanted to glass for bears and anchored up for the night. We had pulled prawn and crab pots and were eating a huge dinner when we spotted the bear in the grass meadow feeding about an hour before dark. We hadn't really planned on hunting that night so we hurried up and got dressed, my cameraman got his gear together and we headed to shore in one of the skiffs. Bob guided the skiff quietly into a downed tree where I got out of the boat and got set up and we ranged the bear at 178 yards. I had a Burris fast Fire 1x magnification sight on the gun and I wanted to take only shots inside a 100 yards to be sure my bullet placement was true and to get the best terminal performance from the 405 grain copper Powerbelt bullet. This is where it got tricky ... to close the distance we had to get back into the boat and cross the river, which was rising with the tide. The only place left to set up was an old root wad that was less than 50 yards from the bear. Bob quietly poled the boat across the river and I stepped off and waded shallow water to the root wad and climbed up and took aim. When I had the thumbs up from the cameraman I took the shot ... but the CCI 209 primer was a dud and the click of the hammer dropping and the pop of the bad primer flashing back caught the bear's attention. He stared me down for what seemed like forever before going back to feeding -- I put a fresh primer in and this time when I took the shot, the gun went off and the bullet struck perfectly and surprisingly the bear dropped in his tracks. The big bear was down and on the first night the hunt was over! We got the bear onto some dry land above the high tide mark and came back the next day for photos and video because by this time darkness was setting in ... only then did I really see what we had done. And a few hours later on the back deck of the boat, using my Boone and Crockett measuring tongs did we come up with the whopping score of 26 2/16" B&C (green) which even with some expected shrinkage should easily eclipse the current muzzleloader world record of 23 2/16. We plan to have the skull officially measured on August 1 - the 60th day after the date of kill as required by Boone and Crockett rules. On that day we expect to not only have a certified B&C entry into the all-time record books but the new muzzleloader world record.